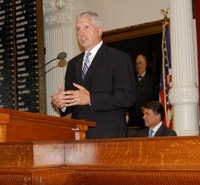 As executive director of the University Interscholastic League, Breithaupt is the chief overseer of public-school academic, music and athletic competition in Texas. He previously spent 14 years as the UIL's athletic director, responsible for the body that governs more than 1,400 Texas schools, including the biennial reclassification and realignment process. Among the changes that have transformed high school football during his tenure are playoff expansion, steroid testing, concussion protocols, Zero Week, expanded 7-on-7 opportunities and, most recently, a common site for state championships. In 2013, all 12 title games were played at AT&T Stadium in Arlington before crowds totaling more than 230,000, including a record 54,000 for a single game, and televised live. Before joining the UIL in 1992, Breithaupt spent almost two decades as a teacher, coach, athletic director and principal at Buna, Hardin-Jefferson and Beaumont West Brook. He has coached football, baseball, track and field, and cross country, but is best known as the longtime basketball coach at Hardin-Jefferson, where he was 292-57 and led the Hawks to the 3A finals in 1984 and to the state championship with a 37-1 mark in 1991, when he was named Texas State Coach of the Year. He also coached at West Brook, where his 100-35 ledger included playoff teams in each of his four seasons. He was inducted into the Texas High School Basketball Hall of Fame in 2003 and the Texas High School Coaches Association Hall of Honor in 2005.